Start your evil corporate empire today. Spinnortality is the second just-released cyberpunk game I’ve written about today, but it’s coming at the setting from a very different angle than Re-Legion. Instead of taking down corps and sowing chaos, this sinister management game is all about ruining the world as one of those corps. You can start your own Facebook, essentially, though you’ll also want to be competent if you expect to reach the ultimate goal: immortality. It’s more anti-cyberpunk really, at least in the sense that you’re creating a dystopia that any punk would be eager to fight. Create products, get people hooked on them, build your own workforce, manipulate governments, spread fake news, spur on riots—it sounds like there are plenty of ways to make the world a really, really awful place to live. Andy attempted to take over the world with his own megacorporation in Spinnortality, but instead he just stole from his workers. I’ve just launched a social media network in Europe that, based on your personality and posting habits, buys things before you even know you need or want them. But it’s a disaster. The angle is all wrong, the market hates it, and I’ve lost millions. But while this may have ruined a lesser company, the PC Gamer evil megacorporation has a plan to dig itself out of this hole. I decided to siphon cash from my pension fund, yielding up to $20 million for each worker I currently have employed. There’s a chance I’ll get caught, ruining my reputation, but it’s worth it. A few turns later and my bank is full of dirty money. I only hesitate starting one myself because it does feel just a tiny bit weird to be playing a Bezos or Zuckerberg for fun when they’re underpaying workers so they can go into space, help to weaponise social media or whatever awful scheme they’re cooking up today. It’s a bit gloomy. But who knows? Maybe the real way to win Spinnortality is to create a small business that sells affordable medicine for puppies and not be evil. It’s worth a shot! 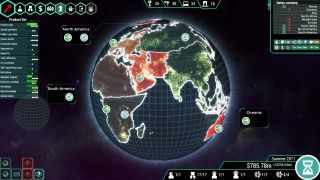 Spinnortality is out now on Steam for £9/$9.